Most women would describe their lifelong relationship with lipstick as nothing short of tumultuous (and have a stash of barely-used lipstick bullets to prove this). With seasonal influences, new launches, and fast-paced trend turnovers, our lips are at the mercy of an ever-changing lipstick diktat. Rather than submit to convention however, adopt a timeless approach to customising your go-to lip look; whatever your age, a perfect pout elevates your look and brightens your face. In your twenties, as your lips are naturally full and plump, you’re free to experiment with colour and texture and embrace current trends. Apply lipstick straight from the tube for an intense colour effect, or blend two shades together for an ombré effect. 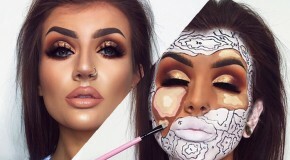 Bear in mind that if you’re sporting a bold eye, your lips should be soft and neutral, and if you’re doing a strong lip, make sure you’re wearing subtle eye makeup. 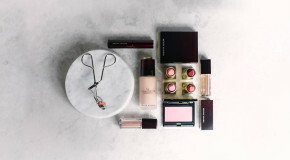 Illamasqua’s Glamore Lipsticks are all you need to add definition and a rich, dense coat of colour – plus they stay put without suffocating the lips. Alternatively, try L.A. Girl’s Matte Flat Velvet Lipsticks – the comfortable texture glides on and dries down to an opaque, velvety layer of colour that lasts and lasts – a no-brainer for those who love a bold pop of colour. You’re in your thirties, but grown up lipstick needn’t be dowdy – a bolt of bright colour can update your look instantly. Pigmented formulas with a rich colour payoff will give a fresh and contemporary look, but be sure to consider the texture. Your lipstick may start feathering as fine lines appear around your mouth, so opt for a long-lasting stain to prevent colour from bleeding, and layer a lip balm over colour to keep it locked down. Precision is key; liquid lipsticks with doe-foot applicators make flawless application effortless. Try Stila’s Stay All Day Liquid Lipstick, which marries the smoothness of a gloss with the pigment and precision of a lipstick. 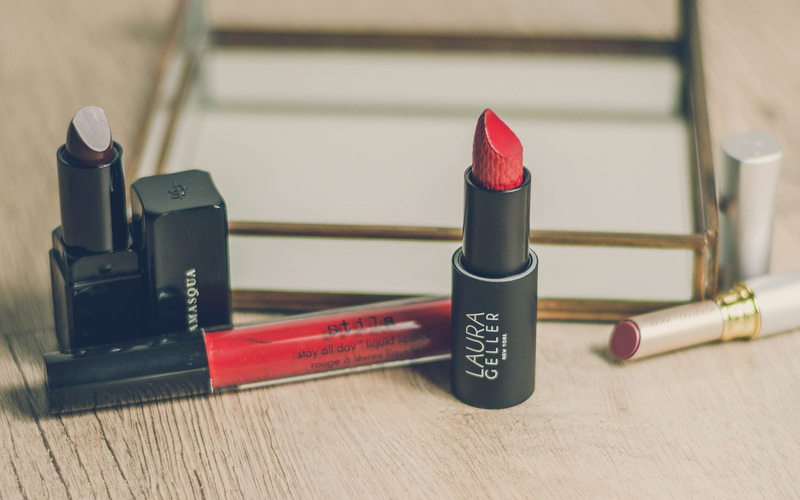 For those who prefer a more conventional option, opt for Laura Geller’s Iconic Baked Sculpting Lipstick, which saturates the lips with a creamy wash of colour in a single swipe. Your forties are not the time to experiment with textures and colours you’ve never worn before; instead, stick to what you know works for you – comfort and ease is key. As you age, you lose pigment (and therefore definition) in your lips, so to appear more youthful, opt for a colour a little darker than your natural lip shade in order to add fullness. Plum, brown, and berry hues are universally flattering and easy to wear. Kevyn Aucoin’s Expert Lip Colour is our pick for its softening, hydrating properties – the sheer, creamy formula is rather like a tinted balm, but with an extra-rich dose of pigment. For ease of use (especially when on-the-go) we adore Zoeva’s Lip Crayons – an effortless means by which to plump, moisturise, and colour the lips in a range of flattering, neutral tones. Lips loose their plumpness in your fifties as your body produces less collagen; however, with the right products and clever contouring techniques, it’s easy to cheat the appearance of fuller lips. Line them with a pencil in the same shade as your natural lip colour before applying a peptide-enriched lipstick such as Jane Iredale’s Just Kissed Lip Plumper, which boosts collagen production. Opt for wearable shades – something between your lip colour and a berry shade will subtly enhance your natural tone for a ‘my lips but better’ effect. Stay away from products with a matte finish as they will make your lips look flat, and remember that you’re never too old to wear lipgloss – dab a little in the centre of your lips for a youthful plumpness. Harnessing a secret blend of lip plumping ingredients, DuWop’s Lip Venom stimulates blood flow to the lips to subtley swell them, as well as adding intense shine. When you reach your sixties, lines and wrinkles around your mouth present the biggest obstacle when striving for flawless lipstick application. Use a neutral liner such as Kevyn Aucoin’s The Flesh Tone Lip Pencil to line and fill lips – this will prevent colour from bleeding into creases. Further improve results by pressing on lipstick with a brush – applying straight from the tube can overload the lips with pigment, which easily migrates. Colourwise, neutrals can leave you looking washed out, whereas neon brights and vampy hues will look too harsh. Find a middle-ground in soft warm hues like rose and berry, which will define lips and add vibrancy without overpowering your look. Likewise, beware of products with matte or pearlescent finishes, as these will emphasise lines and make lips look smaller. Instead, choose long-wearing stains like Edward Bess’ Water Colorist Long Wear Lip and Colour Stain for a natural-looking veil of durable colour.